My father-in-law is a computer wizard. All I can really tell you is that he builds super computers for Oracle, and after about the first 30 seconds of explaining his job to me I had no idea what he was talking about. This means he’s a very inquisitive guy and loves numbers and statistics and pretty much everything I don’t like. Well, apparently, the other day he was reading a gun article where someone was saying it was better to draw the gun slowly and that quick drawing was bad because it drew attention to the person, etc. etc. etc…. And my father-in-law asked me to find the statistics on this and wanted my opinion about which draw I thought was better. And even though he’s committing the sin of living in California, he did play a pretty important part in producing my wife, so I decided to see what I could find out for him regarding quick draw vs. slow draw. I can tell you that Officers in Baltimore County Maryland have a hit ratio of 64%… 77% of shootings occur in some type of low light… And that when one officer is involved in a shooting he averages a 51% hit ratio… but if it’s a multiple officer shooting the hit ratio drops to 23%. In other words, I found a lot of statistics, but nothing on quick draw vs. slow draw. So here’s what I can tell you from my own experience. The two times in my life when I had to draw my firearm it couldn’t come out fast enough. If someone is coming at you with a knife at an ATM machine, that gun should come out lightning fast. If a guy is approaching your car with a gun, you better draw quick. I read a story last month about a criminal with a knife charging a guy and his girlfriend in a restaurant parking lot. The guy drew quickly, his girlfriend ducked and he shot over her to kill the attacker. There are instances where slow draw may be appropriate. 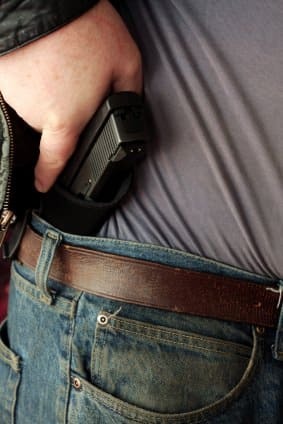 For example, if you’re in a restaurant and all of the sudden a guy pulls out a gun to rob the register it’s probably not a good idea to whip out your gun and start shooting. Let the guy rob the place and give a good description for police. Or if you’re standing in line at the bank and the guy in the line next to you throws on a ski mask and takes out a shotgun to rob the place you may want to remain still. But, if he starts shooting people then you know it’s more than a robbery and you better draw that gun quickly and deal with him. The bottom line is, quick draw vs. slow draw depends purely on the circumstances. One day you may find yourself in a position where you have to slowly draw the gun under a restaurant table to see what the robber is going to do. But if I had to guess, I’d bet the majority of times a gun is drawn it’s coming out quick, which is why I believe if you carry concealed you better be able to draw your gun and get it on target in 2 seconds or less.